A few weeks ago I made a post asking you to vote Timothy Cardinal Dolan, Archbishop of New York into time Time 100. Well… He made it!!! Each year Time magazine compiles a list of the 100 most influential people in the world. This is His Eminence’s first appearance on the list. As stated Dolan is currently Archbishop of New York, having been enthroned just over three years ago. He is also the current president of the United States Conference of Catholic Bishops (USCCB), and his Vatican title is Cardinal-Priest of Nostra Signora di Guadalupe a Monte Mario. Since January Cardinal Dolan has led the bishops of the United States in the fight for religious freedom against the Obama administration’s mandate that Catholic institutions break moral conscience and provide contraception and abortions to employees. Dolan has united the bishops of the United States in a way that hasn’t been seen in decades. Dolan has stood up and taken an unpopular position in today’s world. He has been the first U.S. Church leader in years to come out publicly against the sin that is contraception on a large scale. It is my hope that many Catholics who are living with the mortal sin of contracepting will realize what a mistake they have made and come back into communion with the Holy Mother Church. For years Catholic bishops have been silent on the moral corrosion of society. This corrosion has even reached the poorly catechized faithful of the Catholic Church. Now, under Cardinal Dolan the bishops of the United States mean to fight back against sin even if it mean ruffling a few feather and making more than a few uncomfortable about their choices. 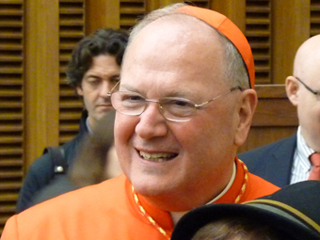 Congratulations Cardinal Dolan and thank you for having the bravery that so many have not had.